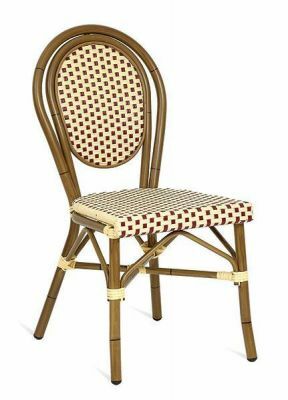 Outdoor dining chair with an artificial bamboo frame and Cream and Red weave design. Available from stock for free and fast delivery. Comes assembled and ready to use. Original style bamboo frame chair with a red and cream diced weave seat and back. Suitable for a range of different applications including home terraces and conservatories, garden centres and outdoor leisure seating.